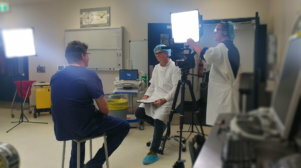 As a Video Production Company, Laundry Lane Productions works closely with many of the leading providers across the healthcare industry in Australia. From research departments to major hospitals, medical technology companies and various government departments and agencies, Laundry Lane Productions has developed a unique approach that is at the core of everything we do. We are specialists in finding the human element of a story, getting past the jargon, focusing on real people and genuine emotion – and have found this has particular relevance in the area of health. Our experience in producing video content for the healthcare industry has developed from a deep understanding of the communication challenges that are present in this specialist area. The content that we create for our clients is dependant on their goals and objectives and is intended to strengthen the connection they have with their target audience. From explainer videos designed to educate patients, to internal training videos for staff, we take pride in the exceptional content that we deliver to our clients. As video production specialists and health advocates, we understand the communication challenges of this specialist area. We listen to our clients and deliver video content that addresses their objectives and strengthens their connection with their target audience. We aim to tap into the passion of the people who devote their lives to the challenges of delivering better health outcomes. We are driven by the things we love; uncovering the emotion and human angle in a story, conducting interviews with sensitivity and compassion and drawing out those unexpected gems that makes a video (and your audience) light up. We call it Video With Heart. We create engaging video for your website, social media, conference or event. As a video production company, Laundry Lane Productions employ extensive experience in the interviewing, production and editing process to ensure our health partners feel supported. Our interviewers are highly skilled and have had extensive experience conducting interviews with a broad range of professionals from the health, medical, education, government, not-for-profit and corporate sectors and we also work regularly with CALD and Indigenous communities. We always approach interviews of sensitive nature with empathy and approach all of our projects in a culturally mindful and appropriate manner. We have extensive experience across the health sector offering engaging explainer video production for your website, social media, health conference or event.